WASHINGTON (May 17, 2017)—A new study examining how ice forms from pure water found that the geometry of the surface that water is on can have an effect on whether or not it freezes, suggesting that surface geometry plays an important role in ice formation. Greater understanding of how ice forms could have implications ranging from transportation safety to food production. Ice typically forms around particles like pollen or dust, but ultra-pure water can remain a liquid down to -40 degrees Celsius. Because of this, the surface that ultra-pure water is on can have a big impact on formation of ice crystals. However there has been no successful theory to predict which materials are good at forming ice. Using a computer simulation, researchers at the George Washington University found that ice forms most efficiently in a wedge shape containing 45-degree or 70-degree angles, likely because it allows water molecules to align in a way that helps form an ice lattice. Therefore, a surface textured with these tiny angles would freeze over before a surface with a different geometry. Before this breakthrough, no other model has been able to help predict which surface geometry might trigger ice formation. The research team discovered that a 45-degree wedge promotes the formation of an imperfect ice crystal containing something called a topological defect. Topological defects in materials are irregular areas in an otherwise perfectly uniform structure. “Once such a defect is formed, it can facilitate the growth of regular ice around it,” Dr. Li said. This is the first time a study has provided clear theoretical evidence on the explicit role of defects in crystal formation. While ice formation is a daily phenomenon, the freezing process is poorly understood. 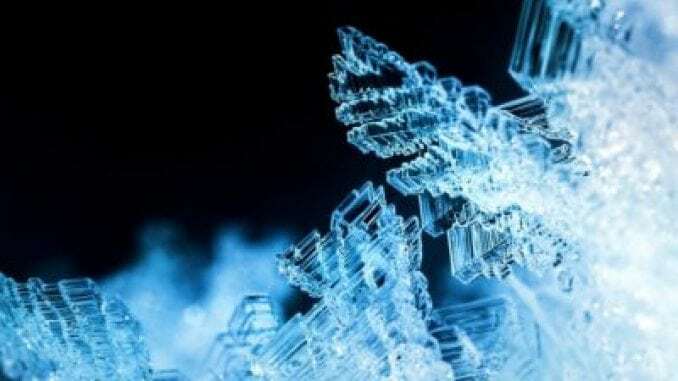 The researchers hope to contribute to a better understanding of ice crystal formation and growth by applying the research from the computer models to physical labs for further testing. By understanding how to control whether ice crystals form or grow, researchers have the potential to influence everything from airplane surfaces that stop ice growth to better-tasting ice cream. Credit for image: Ice Crystals.